Diabetic foot (DF) is a grave macro and microvascular diabetic complication that consists of different types of lesions in tissues harboring severe neuropathy and ischemia. The incidence of diabetic foot has increased due to the worldwide prevalence of diabetes mellitus, the prolonged life expectancy of patients and the increased prevalence of obesity. In fact, according to the WHO projections, “diabetes will be the seventh cause of mortality in 2030". Currently, women and men alike constantly try to improve personal appearance, whether due to a deformity or pure aesthetics. As a consequence of the lack of knowledge, non-qualified health personnel offer dubious surgical techniques, which they claim to be safe and economical, which consist of injecting different modeling agents, but the indiscriminate uncontrolled use of many types of such fillers applied in different manners have produced very serious and even fatal complications. In the case herein reported such a dangerous complication was observed and treated in an adult female who received multiple bilateral injections of a modeling agent. HPI: Mrs. A. G.L. a 57-year-old. a white Caucasian female, was seen in the office on March 11th, 2015 with a history of T2D for more than 10 years. The patient was adequately controlled with 12 U of insulin daily and followed her diabetic diet. She informed us that in August 2015 noticed discomfort and pain in her right leg and ankle with redness and swelling. She consulted 2 angiologists whom applied several creams and dressings and prescribed antibiotics without improvement of the lesions. She was told that an amputation could probably had to be done. The patient also reported that "25 years ago a female cosmetologist applied 22 injections in each leg of a modeling agent, probably silicon” and that to date they had not caused any alteration." Initial examination revealed a pale female patient complaining of pain in the right leg. She had normal and stable vital signs and physical examination revealed alterations in both pelvic limbs. In the right leg and ankle, extensive cellulitis with necrosis was found from the lower third of the inner side of the leg to the ankle (Figures 1 and 2). There was intense pain on palpation in these lesions. No pulses were felt nor there was a positive signal with the Doppler system in any of the lower extremities below the popliteal region. Neurological examination revealed extensive areas of neuropathy mainly in the plantar and distal areas of the right foot. Analgesics were administered, blood samples were taken as well as radiographs of the right foot and leg that ruled out evidence of osteomyelitis. The glucose was 124 mg% and the glycosylated Hgb was 11.1 mg%, hemoglobin 10.4 g%, with leukocytosis of 17,000 mm3 and a creatinine of 1.6 mg% and the seriousness of the situation was explained to the patient whom authorized an initial urgent debridement. Ketorolac 30 mg I.M. was applied and a 3 cm incision was made and 10 ml of malodorous dark pus was drained and samples were sent for aerobic and anaerobic cultures and sensitivities. Moxifloxacin 400 mg P.O. daily was prescribed, and the patient was instructed to wash the affected area every morning and apply Pebisut®* once a day and return to consultation in 48 h. The culture was positive for Staphylococcus Aureus Coagulase Positive and Escherichia coli, both of which were resistant to most of the commonly prescribed antibiotics. A definite improvement was noticed 7 days after starting the treatment, cleansing of the lesion was done in the clinic weekly and on the 2nd week moxifloxacin was suspended. Ferrous sulfate was started, 60 mg P.O., Q.D., and a high protein diabetic diet was added. It was then appreciated that there was a fistulous tract from the site of the incision to the upper inner aspect of the leg, so under local anesthesia with sedation in the American British Cowdray Hospital, a debridement with opening of the fistula tract was carried out in the 3rd week (figure 3 small irregular fragments (grayish-brown foreign bodies 3-4 mm. in size) were removed. 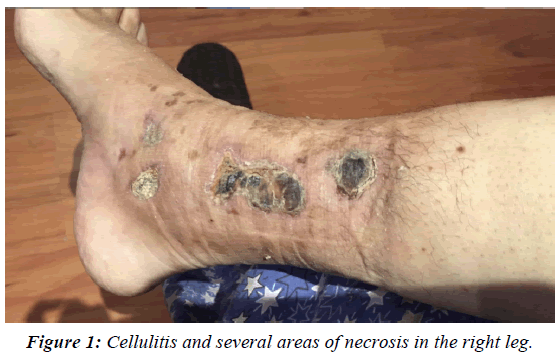 Figure 1: Cellulitis and several areas of necrosis in the right leg. Figure 2: Fistulous tract between the ulcer area and the upper medial aspect of the leg. Figure 3: A large Foreign Body is seen between the exposed tibia and skin (arrow). The lesion improved slowly and in March 2016, although the initial ulcer partially healed a distinct large painful firm mass was noticed in the upper and anterior part of the leg and a surgical exploration was done under general anesthesia at the American British Cowdray Hospital. The incision was extended 10 cm from the upper border of the fistula and an irregular foreign body measuring 6 × 3 cm and several smaller fragments were removed (Figures 3 and 4). The tibia was exposed but without evidence of osteomyelitis or bone fragments. The pathologic examination reported a "modeling agent, probably silicone" with evidence of intense acute and chronic inflammation in the surrounding tissues. 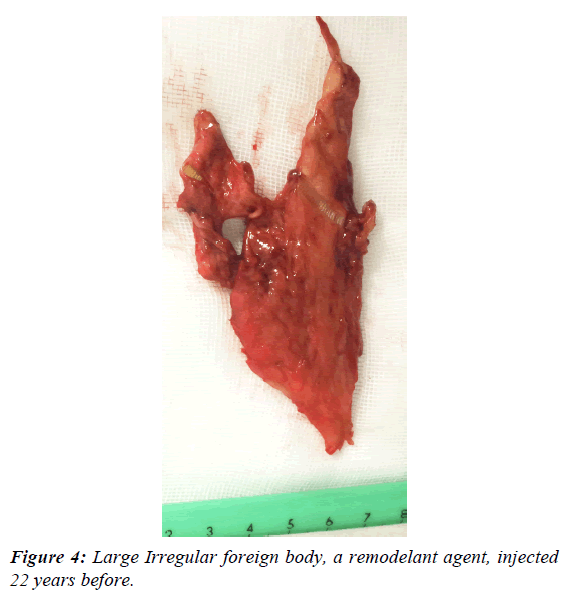 Figure 4: Large Irregular foreign body, a remodelant agent, injected 22 years before. The general condition of the patient improved substantially and healing was evident. From October 2016 to March 2017, additional, smaller fragments were removed in many office procedures until an almost complete healing was achieved. In March 2017, insulin was replaced by metformin P.O. 500 mg every 24 h with a Hemoglobin A1c of 6.2%, and a Hgb of 12.1 g%. 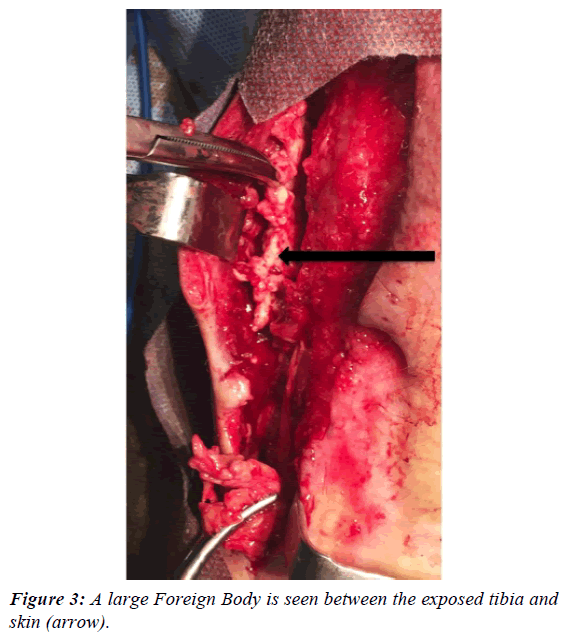 In September 2017, a new area of infection was seen in the lateral aspect of the ankle, which was debrided and several fragments of the modeling agent were extracted (Figure 5). The wound healed completely in 10 days. When the lesion was completely healed in October 2017 (Figure 6), a podiatrist consulted elsewhere “attended a callus” of the plantar aspect of the right big toe on November 3 and the result was a necrotic lesion infected with pus and extensive cellulitis and edema in this area which was debrided under sedation and topical anesthesia (Figure 7). Moxifloxacin 400 mg PVO was administered for 12 days and Pebisut® applied once daily and the response of treatment was satisfactory 10 days later with complete healing. In the left leg several hard tumorations can be seen and palpated in the lower third of the inner aspect, which probably correspond to the equivalent of the material injected into the right leg several decades ago, but there is no evidence of inflammation nor infection at this time. 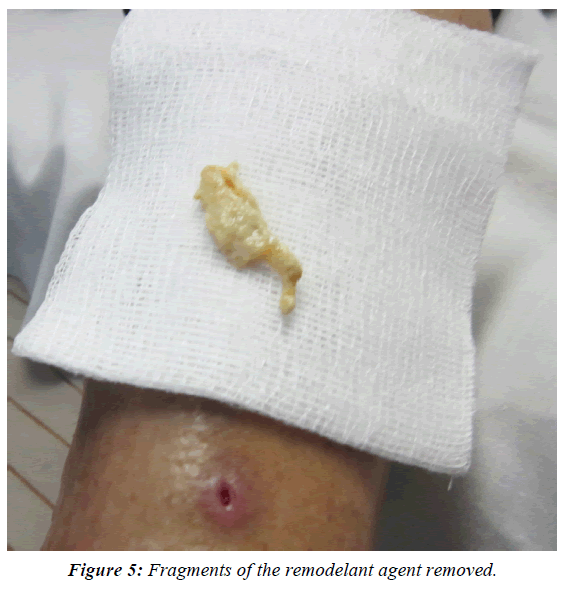 Figure 5: Fragments of the remodelant agent removed. Figure 6: Complete healing of the lesions of the right leg. Figure 7: Infected necrotic ulcer of tshe right big toe complicating a podiatric intervention. Although the true prevalence of DF is unknown it is generally estimated between 6-10% of diabetic patients [1-5] and that nearly 25% of diabetic patients eventually develop an ulcer in their lifetime . The grave prognosis of DF is well known, and in a recent excellent multicentric study by Ndosi et al. with infected diabetic ulcers, 15.1% of patients had died within a year of the positive culture. It is also known that DF complicated with extensive neuropathy, infection and ischemia are associated with elevated morbidity, hospitalization, amputations and increased mortality [8,9]. In the case herein reported like in many others seen in our institutions another well-known detrimental factor is the delay in establishing a proper diagnosis and providing an early and adequate treatment which occurred in this female patient mistreated during 4 months. In fact, in the previous consultations the probability of an amputation was mentioned to the patient. At the present time there is not a really effective treatment for chronic ulcers of the legs including diabetic foot "Even with the best care available today, between 25-50% of ulcers in the lower extremities and more of the 30% of that of the feet, have not healed after 6 months of treatment" [10-13]. On the other hand, numerous complications have been described as a consequence of injections of different types of fillers for cosmetic reasons, some of which are extremely serious or even fatal and with serious disabilities and complicated with expensive legal consequences [14-17]. Recently the FDA has issued an alert to the population, including doctors, in which it warns "injectable silicone is not approved to enhance or augment the body. Such use can lead to ongoing pain, infections, and serious injuries, such as scarring and permanent disfigurement, embolism (blockage of a blood vessel), stroke, and death". It is also mentioned that "surgery to remove largescale injectable silicone may present additional risks" such as partial or complete amputation, or in the worst case it can lead to death . Pebisut® an innovative biological molecule composed of a naturally occurring polymer combined with zinc oxide (ZnO) initially used as a surgical adhesive [19,20] has demonstrated an anti-inflammatory and antibacterial activity and it is also widely known that ZnO modulate inflammation and that Zinc nanoparticles also have demonstrated such antibacterial activity [21-25]. During wound healing, acute inflammation is necessary to repair the damage, although dysregulated inflammation is a hallmark of a non-correctly healing wound. The anti-inflammatory properties of Pebisut® have allowed the use as a treatment of chronic venous leg ulceration that are typical lesions with impaired healing because of a persistent exacerbated chronic inflammatory process, local treatment with Pebisut® shows enhanced healing of ulceration and improves quality of life . Moreno et al have shown that Pebisut® induces lower production of IL-1, IL-6 and IL-8 after stimulation with lipopolysaccharide in an in vitro model and Pebisut® produces lower chemotaxis of inflammatory cells to the stimuli with CCL2, CCL5, and CXCL12 chemokines, resulting in a lower infiltrate of macrophages and lymphocytes in an experimental model of acute inflammation . All these properties of the Pebisut® could explain the successful result obtained in this patient. In fact, the initial bacteriology cultures done in this patient revealed only M.R.S.A. Staphylococcus Aureus and it is important to mention that the initial results of bacteriological tests at the Laboratory of University of Anahuac by our group as well as those carried out at the National School of Medicine (I.P.N. ), have shown a definite bactericidal effect of Pebisut® against Staphylococcus Aureus and the M.R.S.A. too . Likewise, Maltodextrins also share this type of antibacterial activity . The combination of a strict diet, adequate glucose control, local debridements and/or more extensive surgical procedures with locally applied Pebisut® and the judiciously use of antibiotics in this very cooperative patient  proved to be successful. Although the result of the treatment in this patient was successful and an amputation was avoided, it is impossible to determine if these lesions could recur in the affected limb or in the left leg that also received a similar number of injections. At any rate, the experience gained in this patient will alert us -as well as other physicians and nurses-, to institute a prompt and adequate treatment should this happen in a similar type of patient. A gravely complicated case of a Diabetic Foot in an adult female with multiple modeling agent injections in both legs 22 years previously is described. A prolonged treatment with several surgical debridement’s and the judiciously use of antibiotics with the daily application of an innovative new topical product, Pebisut® produced a satisfactory result. Diabetes. World Health Organization 2017. Gordillo J, Alegre E, Torres I, et al. Multidisciplinary approach of human diseases caused by infiltration of Modeling Substances Cirugía Plástica Ibero-Latinoamericana. 2013;39:269-77. Zhang P, Lu J, Jing Y, et al. Global epidemiology of diabetic foot ulceration a systematic review and meta-analysis. Ann Med. 2017;1:1-24. Alavi A, Sibbald G, Mayer D, et al. Diabetic foot ulcers Part II. Journal of the American Academy of Dermatology. 2014;8:231-34. Armstrong D, Boulton A, Bus S, et al. Diabetic Foot Ulcers and Their Recurrence. N Engl J Med. 2017;376:2367-75. Ndosi M, Wright-Hueghes A, Brown S, et al. Prognosis of the infected diabetic foot ulcer: a 12-month prospective observational study. Diabetic Medicine. 2017;35:78-88. Brownrigg JR, Davey J, Holt PJ, et al. Cost, The association of ulceration of the foot with cardiovascular and all-cause mortality in patients with diabetes: a meta-analysis. Diabetologia. 2012;55:2906-12. Lavery LA, Armstrong DG, Wunderlich RP, et al. Diabetic foot syndrome: evaluating the prevalence and incidence of foot pathology in Mexican Americans and non-Hispanic whites from a diabetes disease management cohort. Diabetes Care. 2003;26:1435-38. Zenilman J, Valle MF, Malas MB, et al. Chronic Venous Ulcers: A Comparative Effectiveness Review of Treatment Modalities. Agency for Heathcare Research and Quality. 2013;13:1-77. Lipsky BA, Berendt AR, Cornia Pb, et al. Infectious Diseases Society of America clinical practice guideline for the diagnosis and treatment of diabetic foot infections. Clin Infect Dis. 2012;54:132-73. Smith M, Totten A, Hickam D, et al. Pressure Ulcer Treatment Strategies: a systematic comparative effectiveness review. Agency for Healthcare Research and Quality. Ann Intern Med. 2013;159:39-50. MacGill A, Saysoukha V, Jerry K, et al. . Foreign body-induced brodie?s abscess in the calcaneous: a rare case report. JSM Foot and Ankle SciMed Central. 2017;2:1039. Rayess H, Svider P, Hanba C, et al. A cross-sectional analysis of adverse events and litigation for injectable fillers. JAMA Facial Plast Surg. 2017;1:1888-90. Rayess H, Svider P, Hanba C, et al. Adverse events in facial implant surgery and associated malpractice litigation. JAMA Facial Plast Surg. 2018;1:2242-7. Pasternack F, Fox L, Engler D, et al. Silicone granulomas treated with etanercept. Arch Dermatol. 2005;14113-115. FDA. Injectable Silicone for Body Contouring and Enhancement: FDA Safety Communication- FDA Warns Against Use. 2017. Cueto J, Barrientos T, Rodríguez E, et al. A new biodegradable adhesive for protection of intestinal anastomoses. Preliminary communication. Arch Med Res. 2011;42:475-81. Cueto J, Barrientos T, Rodriguez E, et al. Further Experimental Studies on a Biodegradable Adhesive for Protection of Colorectal Anastomosis. Arch Med Res. 2014;45:331-36. Moreno MA, Monroy LE, Torres Y, et al. Potent Anti-inflammatory activity of carbohydrate polymer with zinc oxide. BioMed Research International. 2014. Cueto J, Moreno M, Bahena Z, et al. Treatment of Complicated and refractory varicose with maltodextrina polymer and zinc oxide. Mexican Magazine of Angiology. 2015;43:102-08. Moreno-Eutimio MA, Espinosa-Monroy L, Orozco-Amaro T, et al. Enhanced healing and anti-inflammatory effects of a carbohydrate polymer with zinc oxide in patients with chronic venous leg ulcers: preliminary results. Archives of Medical Science. 2016. Cueto J, Moreno M, Ibáñez T, et al. Results of the treatment of venous ulcers with a polysaccharide polymer with zinc oxide. Med Int Méx. 2016;32:48-57. Cueto J, Moreno-Eutimio MA, Moreno J, et al. Effect of a polysaccharide polymer with zinc oxide in the reduction of the size of chronic venous ulcers. Mexican Magazine of Angiology. 2016;44:67-71. Vilchis R. Aparicio G. Antimicrobial effect of a healing agent on methicillin-resistant Staphylococcus aureus clinical isolates(MRSA). National School of Biological Science. Mexico City. Galvez-Figueroa GO, Vilchis RE, Donis J, et al. Bactericidal activity of Pebisut®, a healing agent?, Presented in part at the XXI National Congress on Biochemical Engineering and the XVI Biomedicine and Molecular Biotechnology Scientific Meeting, Merida Yucatan. 2018; 21-23. Korresteijn J, Driegsman D, Assendelft W, et al. Patient education for preventing diabetic foot ulceration. Cochrane Database Syst Rev. 2010;12:20-25. Weigelt J. Diabetic foot infections: diagnosis and management. Surg Infect (Larchmt). 2010;17:295-98.